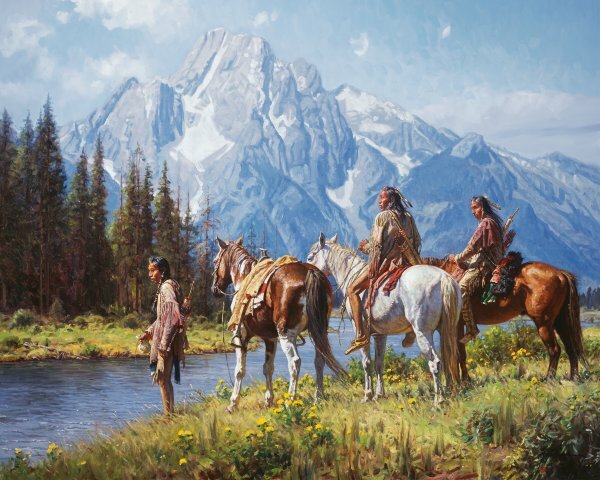 Martin Grelle enthralls his collectors with powerful narratives of the Native Americans. Their culture offers a rich history, and Grelle carefully researches his subjets, painting all the historic details that are his trademark. These three braves, with their horses, have stopped by the "River's Edge." Perhaps the braves are hunting for food or have been following tracks that now disappear into the river. This magnificent scene along the "River's Edge" is another wonderful story that comes alive on Grelle's canvas.